Samer Saem Eldahr is a music producer and visual artist from Syria. 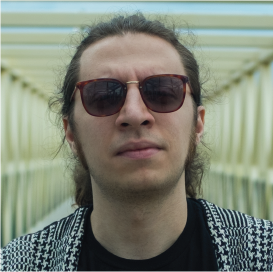 He’s the brain behind Hello Psychaleppo, a music project popular in the Middle East and rapidly gaining international recognition. He is credited for creating a new genre called Electro-Tarab, a combination of dubstep, drum & bass, electro, trap, hip hop and trip hop, fused with Arabic samples, melodies and arrangements. His latest album Ha! combines his skills in music and visual arts to create the first Arabic electronic live set paired with a live visual performance. This concert will be standing room only (disabled seating available) and will take place in The Annex @ AANM.